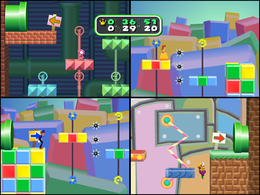 Lift Leapers is a 4-player minigame in Mario Party 6. Player one emerges from the Warp Pipe at the beginning of the course. The screen then splits into four segments. The players must jump onto various platforms to get to the goal. Between each segment of the course is a Warp Pipe. Falling off a platform results in a Lakitu fishing the player out of the abyss below and forcing them to restart at the beginning of the section. The first section has one horizontally moving platform and one vertical, zigzagging platform. The second consists of two vertical moving platforms and two circling platforms, as well as spikes. Touching one results in the player having to restart. The third section is entirely composed of vertically moving platforms. Finally, the fourth and last section is made of cloud platforms and spikes. The first one to finish the course wins, and if no one finishes the course within five minutes, the game ends in a tie. The camera zooms in on the winner's section of the screen, followed by the winner performing his or her victory animation. Rules – "Leap over chasms and between moving lifts to reach the goal! Whoever reaches it first wins!" Advice – "Watch how the lifts move and time your jumps carefully!" This page was last edited on May 13, 2018, at 18:08.